The Zanzibar Snails - "Brown Dwarf"
The Zanzibar Snails are the Denton, TX based duo of Michael Chamy on electronics and Nevada Hill on electric guitar, and what is apparently a rotating cast of musicians for various performances and albums. On Brown Dwarf they are augmented by Josh McWhirter on viola and tapes and Seth Sherman on acoustic guitar. The set opens with a cold steady electronic wave accompanied by viola scratching and warbled notes. The volume increases on the electronics as a fuzzed radio wave joins in and the viola continues to playfully but quietly explore. Voice samples are introduced and things start to get busier and more interesting. Eventually the electronic guitar kicks in and the atmosphere gets increasingly aggressive, creating a noisy free-improv stew. Not only does the volume and intensity level increase but the mood gets darker and even a little sinister, mostly due to the dissonant crashing chords from the electric guitar. Combine that with the violin melody and radio static and you've got quite an engaging conglomeration of sounds, noise and music. Not too harsh. Just enough to make things pleasantly noisy and intense. The viola keeps things somewhat musical, holding its own against the noise and drones. Later in the set the electronics really take off, adding a free-wheeling alien component to the proceedings. The first 4 tracks of this 34 minute set are really one piece. After that winds down the guitar continues to strum quietly, accompanied by light electronics. But the electronics soon start to go haywire, the viola gets an itch that must be scratched, the guitar pounds out steady crashing chords, and a throbbing drone seems to preside over all. Thankfully this is well recorded so the listener can hear how all the disparate elements cooperate and contrast with one another. 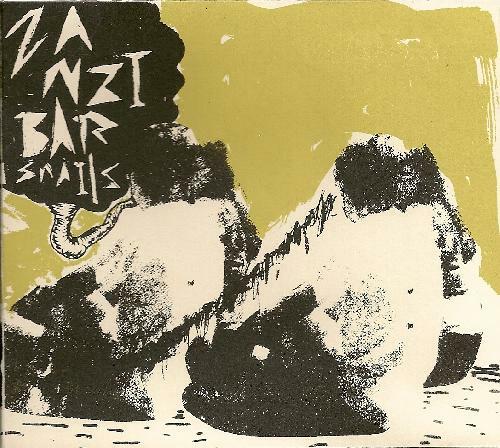 Zanzibar Snails do a good job of keeping things interesting throughout, maintaining a firmly free-improv experimental feel, while communicating a sense of direction and control.